Flowering all year, round this straggly little wildflower can be found growing on disturbed ground, close to walls and on cultivated ground. Rarely reaching higher than 30cm, it has tiny little white flowers (5-10mm across) which have five, deeply-notched petals and between three and eight stamens. The fresh green leaves are oval and opposite.Along the weak, round stems is a single line of little hairs. 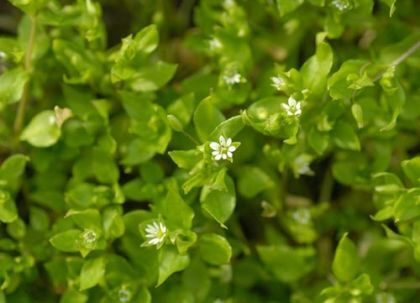 It is an annual and a native plant which belongs to the family Caryophyllaceae. . I first recorded this in my parents garden in Dundrum, Co Dublin in the 1950's and photographed it in Ballybrack, Co Dublin in 2008. This plant was much loved by the budgerigars we kept as children. 16th century herbalish Nicholas Culpeper found it 'a fine, soft pleasing herb under the dominion of the Moon'. It his highly regarded by modern herbalists and used in many preparations such as ointments. 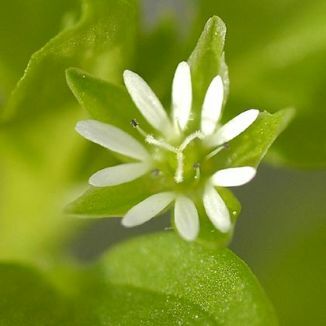 Its scientific name – Stellaria – refers to the star-like quality of its pretty flowers.